Atalanta have won many plaudits for their football this season, finishing a record high of 4th (for more insight into their football, take a read of this excellent analysis by David Selini. One aspect of their play that seems to have flown under the radar though is their use of corners, Atalanta scored 11 goals from 229 corners (a 4.8% conversion rate, significantly higher than the 3% average) finishing with a Serie A high. The following analysis will delve into how Atalanta have smashed the average, and to examine if they’re doing anything special, or if they’ve just been rather lucky. For their first goal from a corner, we see Jasmin Kurtic (#27) start next to Alberto Paloschi (#43) in the 6-yard box, both being man marked with a Torino defender on the post alongside the keeper. We see Ervin Zukanovic (#6), Rafael Toloi (#3) and Andrea Masiello (#5) hovering by the penalty spot with Abdoulay Konko (#25) sitting a bit deeper. Upon the kick take Kurtic makes a dart in the direction of the corner – towards the edge of the 6-yard box whilst Paloschi turns his marker and heads to the back post. The quartet of Zukanovic, Toloi, Masiello and Konko make forward runs with Masiello joining Paloschi at the back post. The goal is largely (if not entirely) the fault of Joe Hart in goal for Torino as he horribly misjudges the corner and doesn’t claim it – instead it falls to Masiello who taps into the empty net. This time we see Atalanta (represented in blue on the diagram) commit 5 players forward instead of the 6 we saw against Torino, most likely due to being going a goal down against Torino, whereas when this goal was scored they were a goal up. Whilst not being the exact same routine, parts of the routine are very similar. Andrea Petagna (#29) replaces Kurtic in starting in the 6-yard box and making a forward run towards where the corner is being taken for the flick on. 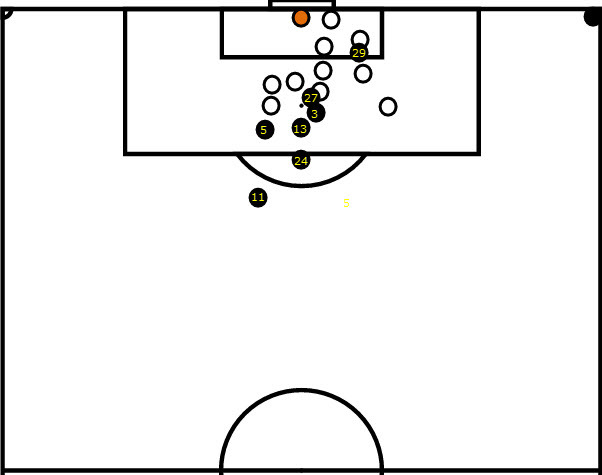 The key part of the routine is the duo of Kurtic (#27) and Zukanovic (#6) by the penalty spot. Both players are being man-marked but Zukanovic fakes out and completely loses his marker. The move also surprises Kurtic’s marker, leaving Kurtic free to make a run into the 6-yard box, getting lucky by deflecting the goalkeepers punch into the net. Like the Torino goal, a bit of luck needed but it looks a well-practised routine. A superb routine. Atalanta again commits 5 players forward for the corner. Kurtic (#27) again resumes his role in the 6-yard box making that forward run for the flick on. The quartet of Masiello (#5), Toloi (#3), Petagna (#29) and Mattia Caldara (#13) all make forward runs towards the goal. The delivery is inch perfect and Kurtic beats his marker to flick the ball on into the danger area where it meets Masiello whose header from a couple of yards out was always going in. We’ve seen shades of this in the previous routines but it’s great to see it come off like this. Pescara had obviously done their homework here as it’s obvious they were set up to nullify Atalanta’s corner routine. A man marker very close to Kurtic (#27) and packing the 6-yard box with players marking zonally would make it difficult for him to firstly challenge for the flick on, and secondly to help prevent the oncoming rush of players for the follow-up. Interestingly, Atalanta committed 6 in the box for this corner (compared to the previous 5 when they were drawing) – however, this may have been due to time running out (the goal was in the 60th minute). Pescara really showed the downsides to zonal marking with only Franck Kessie (#19) and Kurtic having man markers, with 9 outfield players vs Atalanta’s 6 challenging for the ball, Atalanta still got an easy header at goal and is something I’ve mentioned in some of my previous set piece analysis – running at zonal markers will ALWAYS give you an advantage due to momentum. Atalanta were already 2-0 up at this point, so committed their usual 5 men into the box. Again it looks like Sassuolo had done their homework, with Kurtic being man-marked, forcing him to drag his marker away from the action. The trio of Petagna (#29), Caldara (#13) and Gagliardini (#4) all have man markers, along with Zukanovic (#6) a little further back. I really like Sassuolo’s defensive set-up here, incorporating a good mix of man marking and zonal and I would’ve normally expected them to comfortably defend this corner. Atalanta however, did the unexpected and still played it to Kurtic’s head with the ball falling in a dangerous area to Conti who was positioned on the edge of the box to smash the ball into the roof of the net. A fortunate goal and I’d feel unlucky if I were Sassuolo. A lucky short corner gamble that paid off. Alejandro Gomez (#10) takes the corner short to the nearest player (sadly couldn’t work out who that was!) who then plays it back to Gomez. Gomez looks like he’s going to lose the ball but eventually manages to get the ball in and it’s a good goal by Masiello (#5) at the back post. Not much to analyse really from this corner, the players inside the box aren’t doing much in the way of movement – presumably, they thought the same as me – Gomez was going to lose the ball! Initially, this defensive set-up looks like Bologna had Atalanta sussed out, with 3 men marking Kurtic (#27) and another defender placed at the spot he usually runs to. The rest of the players consisting of Masiello (#5), Caldara (#13), Gagliardini (#4) and Petagna (#29) make forward runs towards the 6-yard box but it’s Kurtic who gets the goal, making his standard run and getting a header off with practically no challenge. Poor from Bologna as Atalanta managed to execute their corner routine that Bologna knew was coming. Firstly, I really like this defensive shape that Napoli take – they essentially create a wall of bodies in the most likely zone where the corner will reach. Whilst most zonal marking systems do this, you often find the wall is “horizontal” as in along the 6-yard line, by moving this wall vertically, they’re minimising the risk of conceding from zonal markings biggest weakness – runners. They combine this vertical wall with a smaller wall that’s placed horizontally. I’d be interested to see if Napoli used this shape throughout the course of the season and how effective it was (potentially an article in the near future!). Back to Atalanta though – Petagna (#29) takes the usual spot of Kurtic in the 6-yard box, whilst Kurtic (#27), Toloi (#3) and Caldara (#13) all hover around the penalty spot. Upon the corner being taken, Petagna makes the usual run towards the corner taker, the trio of Kurtic, Toloi and Caldara all make runs in. Nobody gets a touch on the corner initially but Conti (#24) pokes the ball towards goal and Caldara manages to head in. A scrappy finish that’s testament to how well Napoli initially set-up. A very bad defensive setup from Genoa. They have a man marking the short corner when there’s no real option for Atalanta to take the corner short making him completely useless. They have two marking zonally at the near post who are again, almost redundant as nobody is near them and they’d be better off placed elsewhere. That being said it’s very well worked from Atalanta, Kurtic (#27) makes the run towards his usual area and gets a flick on, putting the ball into the danger area and allowing Caldara (#13) an easy finish, having lost his marker. Similarly to the game earlier in the season (discussed above) Bologna have set their players out pretty well with a good use of zonal and man marking, but again they fall short off Atalanta’s routine. Both Kurtic (#27) and Bryan Cristante (#4) make the run towards the corner taker whilst Caldara (#13), Masiello (#5) and Conti (#24) make runs towards the 6 yard box. It’s Cristante who gets the flick on, putting the ball right on the edge of the 6 yard box for Caldara to slot home. Atalanta threw 6 players into the box for this one, consisting of Kurtic (#27), Toloi (#3), Masiello (#5), Caldara (#13), Cristante (#4) and Petagna (#29). Cristante, Kurtic, Petagna and Toloi all make runs towards the zone Kurtic usually runs to whilst Caldara and Masiello hover around the near post for the flick-on. The flick-on doesn’t come as Cristante’s header instead loops into the net. Poor defending by Udinese. From what I’ve explained above it’s very obvious that Atalanta have practised and perfected their routine. They commit either 5 or 6 players into the box depending on the score (always 5 if they’re winning) and the personnel that go forward are always consistent. Player movements are also consistent, one player (usually Kurtic) will stand in the 6 yard box and make a run towards the edge of the 6 yard box for a flick on. Caldara, Toloi and Masiello are the players usually making runs towards the 6 yard box/back post area to receive the flick on. How would you stop such a corner? I think Napoli had the right idea (despite being unlucky), creating a vertical wall of players with a horizontal line of players. This gives the Kurtic limited space to run into, essentially stopping their supply.